60-sec Refresher in Ultimate Boogie Boarding! 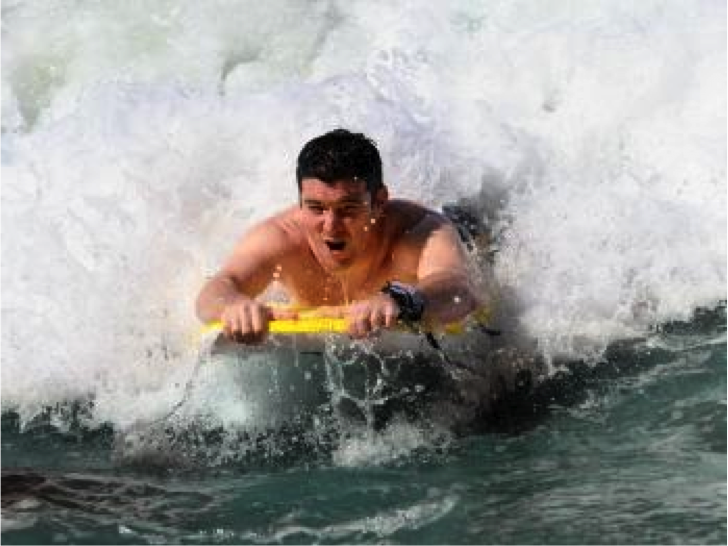 Did you know boogie boarding only came to existence in the last half century? That’s right! Boogie boarding first started up in the 1970’s when surfboard builder Tom Morey took a break from his surfboarding business and made his first prototype of today’s boogie board (back then called a S.N.A.K.E.-side, navel, arm, knee, elbow) His invention caught on quickly and by the late he was producing 80,000 to distribute all across the states! Now everyone can boogie board by simply taking a board and riding it in the ocean. boogie board: You want to first make sure you have the right type of board for you height. You want to make sure it comes up to your belly button when you place it standing up beside you. pair of swim fins: Although not absolutely needed, a good pair of fins will allow you to get a maximum speed and velocity on a wave. Leash:When you buy the boogie board, make sure it comes with a leash so in case you eat a wave, you can retrieve your board! rashguard: A rashguard is a shirt made of stretchy-like material that is designed to put under a wetsuit. It’s primarily used as a protection layer or as an alternative to a wet-suit. Before you choose any ocean, read up on the natural length of the wave currents during the time of day you want to board. This will ensure that you don’t have any disappointment in tiny waves when you get to the beach! -Once you found your sweet spot, start by placing yourself on the board entirely in the ocean. Make sure the back end of the board is at your waist and your feet are hanging off at the end.